This past week has been a cold one! Although we’ve been hibernating, the snow outside has us thinking about all of the things we love to do in Spruce Grove during the winter. More specifically, tobogganing – who doesn’t love tobogganing!? There are some great spots for the whole family to take part in, but here are our personal top 5 favourites. Jubilee Park. What’s not to love about this place?! If you’re one of the lucky few that own a home in Spruce Grove backing Jubilee Park, then you know this tobogganing hill is one of the best. It’s got a great sized hill and the landscaping surrounding it is truly breathtaking. Plus, if you tire of sledding down the hill there’s a man-made ice rink, playpark, and little firepits where you can roast some hot dogs and have some lunch. Hilldowns Park. Nestled in the quiet community of Hilldowns, this tobogganing hill is great for beginners or the most veteran sledders alike. This hill is pretty quiet, at least it was when we went and we really loved that. Spruce Village Park. This hill is definitely not as big a hill as Jubilee Park or Hamburger Hill, making it our top choice if you’ve got a little one under 4. But there’s still a lot of fun to be had here. When the kids get tired of toboganning, (or let’s face it, the adults need a bit of a breather), there’s a park nearby where the kids can keep playing and the adults can recover. Fuhr Sports Park. This good-sized hill is ideally located next to the Tri-Leisure Centre behind the Rotary Playscape. We loved seeing families going tobogganing at this hill to kill some time between the soccer or hockey games their kiddos had at the Tri. Hamburger Hill. This is by far our favourite hill. The climb up the hill is made easier by built in steps – you can choose to go all the way to the top of the hill, or halfway. 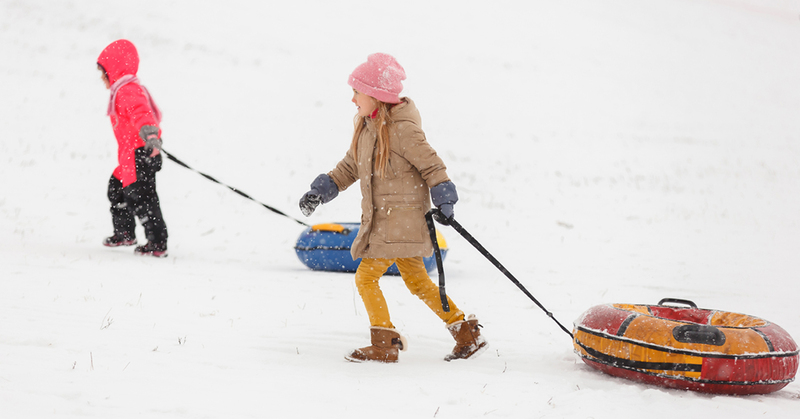 This is typically the busiest hill in Spruce Grove for tobogganing but no need to worry – there’s room for everyone. Make sure to eat a big lunch before heading out – climbing those stairs to the top of the hill is a definite workout! We love the Spruce Grove community and everything that it has to offer to couples and families. If you’re in the market looking for a home for sale in Spruce Grove, consider the wonderful family-friendly community of Spruce Grove. Give us a call, we’d love to help!